Sri Lanka Shipping Company Ltd. (SLSC) Chairman Capt. Lester Weinman has briefed shareholders on the plight of the firm’s ship Avant Garde, which has been detained for almost a year under controversial circumstances carrying “cargo” for a Government company set up by the previous regime. In his review in the Annual Report, the Chairman has said the 2015/16 period was “exceptional” due to significant changes within the company and the external challenges and situations faced. 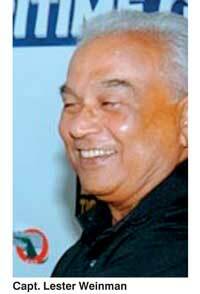 Considered a leading shipping and maritime organisation, SLSC was founded by Robert Senanayake. The Group offers the local and international shipping community the full range of maritime services such as liner and tramp ship agency, joint venture investment in ship agency companies, stevedoring, Customs house agents, clearing and forwarding, heavy lift haulage, towage and salvage, the bagging of bulk fertiliser, warehousing and warehouse management and tea blending and other services relating to the export of tea. SLSC owns eight vessels and two motor launches and Avant Garde is one of the motor tugs. Avant Garde, previously named the Merou, while on charter to Avant Garde Maritime Services Ltd. (AGMS) was detained by Government authorities at the Port of Galle in October 2015. It was alleged that the captain of the vessel entered Sri Lankan territorial waters with arms and ammunition on board the vessel which were under the custody of Rakna Arakshaka Lanka Ltd. (RALL), a fully-owned company of the Ministry of Defence (MOD) functioning under the direct purview of the MOD, without prior Government approval. MOD approval for Avant Garde to enter the Port of Galle was granted a few hours after the vessel arrived off the Port of Galle. Chairman Weinman has told shareholders that the background to this situation was that in March 2014, SLSC purchased the vessel Merou, which was thereafter chartered to Avant Garde Maritime Services Ltd. (AGMS) to operate as a floating armoury in the Red Sea, providing armed maritime security against piracy to international ship owners. Avant Garde Maritime Services Ltd. (AGMS) said that it had the authorisation of both Rakna Arakshaka Lanka Ltd. (RALL) and the Ministry of Defence to operate a floating armoury in the Red Sea on board Avant Garde. Further, it maintained that it was lawfully empowered to charter Avant Garde for this purpose. While on charter, AGMS were given the option to name the vessel to espouse their business as is occasionally the practice between owners and charterers. AGMS exercised this option and requested that the name of the vessel be changed to Avant Garde, which was agreed to. In August 2015, SLSC informed AGMS that the Avant Garde, which was stationed in the Red Sea, required maintenance and the arms and ammunition of AGMS/RALL on board the vessel had to be removed. AGMS thereafter instructed the captain of Avant Garde to sail the vessel from the Red Sea to the Port of Galle where AGMS/RALL intended to remove the arms and ammunition from the vessel and return the vessel for maintenance. A named officer of RALL was appointed to Avant Garde as the custodian of the arms and ammunition for the sea passage from the Red Sea to Galle and was on board at the time the vessel arrived off Galle. While awaiting approval to enter port it is alleged that the Captain of Avant Garde entered the territorial waters of the country. As a result of this, Government authorities detained the Avant Garde in the Port of Galle in October 2015, on the alleged grounds that the Captain of the vessel had entered Sri Lanka territorial waters with arms and ammunition used by AGMS/RALL without the prior approval of the Government. Nevertheless, the Captain and crew remained on board the Avant Garde without any impediment until 23 August 2016, on which date the CID arrested and took into custody the Captain of the vessel. The case against the Captain, a Ukrainian national, has been heard at the Magistrates Courts in Galle and is currently ongoing. “Considering the wide publicity that has been given to m.t. ‘Avant Garde’, we assure all our shareholders that we only acted as ship owners in our dealings with AGMS and that during the period of charter our Captain, officers and crew were only responsible for the safe navigation and maintenance of the vessel,” said SLSC Chairman Capt. Weinman. “Throughout the period that the m.t. Avant Garde has been detained in the Port of Galle we have had no option but to staff and maintain the vessel at considerable costs. We will try to seek reimbursement of these expenses from AGMS. While the investigations continue, our lawyers are making every effort to convince the authorities that the m.t. ‘Avant Garde’ should not be penalised as it has not committed any criminal offense and that the ship’s Captain should be released,” the SLSC Chairman assured shareholders in the company’s 2015/16 Annual Report.